What to do after your vein treatment? Walk for 10 minutes immediately after any treatment. Bring comfortable shoes for this. Walk for 45 minutes every day while in stockings, (this can be several shorter walks throughout the day). Keep your stockings on night and day as instructed (see tips over page). Try to get back to ‘normal’ life immediately. Expect to feel tender and bruised for some time afterwards. Expect the veins to look darker (worse) and feel hard and lumpy for weeks or months after treatment. 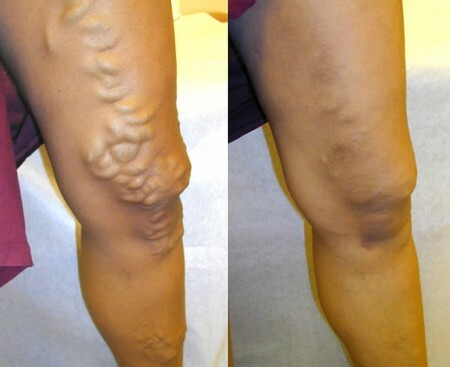 Treated veins will gradually disappear. Avoid high impact exercise, running, lifting heavy weights, wearing high heels, and prolonged standing or sitting while in stockings. Avoid any long haul flights (4hrs or more) within 4 weeks of treatment (either before or after). Take Panadol or Nurofen for pain relief if necessary. Sometimes veins require several UGS treatments to achieve desired result. Treatments are repeated at monthly intervals. Keep stockings on night and day for 1 week after treatment. Even wear them in the shower – they dry quite quickly with a large towel and / or a cool hairdryer. If you have a spare stocking, replace the wet one with a dry one after showering. Sit or lie down when removing or putting on stockings. If the stockings start to slip, contact us on 09 9748844 for a roll on glue. Try to avoid creases at knee and ankle as they can cause irritation. BUT… If your foot is painful or your toes swell in bed at night, or your skin is irritated from creases, take the stocking OFF while in bed, but put it back on before you get out of bed for the day. You do not need to wear it if getting up to go to the toilet during the night. You may take the stocking off in bed and for showers. PLEASE ALWAYS BRING YOUR STOCKINGS WITH YOU TO ALL FOLLOW-UP APPOINTMENTS.